Purple Hearts for Psychic Scars? 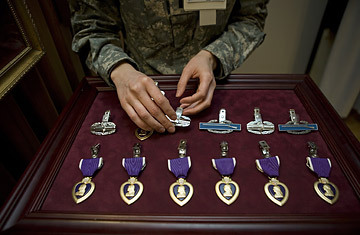 A soldier arranges Purple Hearts, Combat Infantry Badges and Combat Action Badges before a Purple Heart ceremony at Walter Reed Army Medical Center. For every solder killed or physically wounded in Iraq or Afghanistan, some 10 others come home psychically scarred. The Pentagon has diagnosed roughly 40,000 troops with post traumatic stress disorder (PTSD) since 2003, and tens of thousands of others are dealing with it on their own or ultimately will be diagnosed. With the war taking such a heavy psychological toll, some inside the military are starting to ask if men and women who become mentally injured in the service of their country deserve the Purple Heart. To some traditionalists, the idea is absurd on its face, but it is not a theoretical debate the Pentagon is now weighing a change in policy that would make PTSD, in a term only the military could invent, a "qualifying wound" for the medal. The Purple Heart, created by General George Washington in 1782, has historically been limited to those physically wounded or killed in combat. The Army classifies PTSD as an illness, not an injury, which means it doesn't qualify for the honor. But John Fortunato, an Army psychologist at Fort Bliss, Texas, argued in early May that PTSD affects soldiers by physically damaging their brains, making the condition no different than conventional wounds. Soldiers with PTSD often have suffered as much "as anybody with a traumatic brain injury, as anybody with a shrapnel wound," he said. Their ineligibility for a Purple Heart "says this is the wound that isn't worthy, and it is." Advocates of the change like Fortunato believe it would help encourage soldiers with symptoms of PTSD, many of whom are afraid of being blacklisted and having their chances for promotion limited, seek out the help they need. The suggestion has garnered high-level Pentagon attention. "It's an interesting idea," Defense Secretary Robert Gates recently noted. "I think it is clearly something that needs to be looked at." The Defense Department's awards advisory group, which previously ruled that PTSD doesn't merit a Purple Heart, is now studying the issue again. The traditional veterans' groups don't want the rules loosened. "We vehemently disagree" that PTSD is a physical wound that warrants a Purple Heart, says Joseph Palagyi, the national adjutant of the Military Order of the Purple Heart, who earned the medal in Vietnam on June 2, 1968. "We feel that the purity of the medal must be maintained." The American Legion agrees. "Unless PTSD crosses the line and is shown to be an injurywith a direct relationship to the enemywe support the current policy," says Phil Riley of the Legion. Michael Wysong, the director of national security issues for the Veterans of Foreign Wars, likens PTSD to the Gulf War syndrome that afflicted troops following that 1991 war. "Not to diminish the illness or effects of PTSD," he says, "but it is the VFW's belief that awarding the Purple Heart for PTSD is not consistent with the original purpose and would denigrate the medal." The Army surgeon general didn't venture into this minefield when TIME offered him the opportunity. "They haven't asked my opinion about it," Lieutenant General Eric Schoomaker said May 27 of the Pentagon panel reviewing the question. When pressed on the questionshouldn't the Army's top doc have an opinion on whether or not PTSD warrants a Purple Heart? he punted. "Whether or not a medal should be awarded is not in my purview," he said. "The senior operational commander in the Army needs to decide that." It's evidence of the sensitivity of the issue that even the army's senior doctor suggests a second opinion.